Our Book of the Month for June has been inspired by the fantastic feedback we’re receiving about our newest small group program, Confident Kids, which is running across all of our five centres this term. Confident Kids is offered to children in our early intervention program in the lead-up to school to help them develop social communication skills and Theory of Mind. The program was developed in response to some research we’ve being doing over the last few years showing that although over 90 per cent of our graduates head off to school with age-appropriate speech and language skills, these same graduates didn’t necessarily have age appropriate Theory of Mind skills which are critical for the development of social skills and successful inclusion and participation at school. Following a pilot of the Confident Kids Program at our Macquarie Centre last year, we’ve now rolled it out across all centres and are looking forward to sharing the results from our graduating class’s final assessments early next year – but for now we can only imagine the fantastic results! 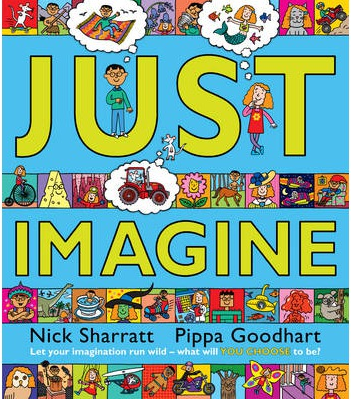 Just Imagine is a wonderful book by Nick Sharratt and Pippa Goodhart that takes children on an imaginary adventure that involves being a giant, living underground and having magical powers! Each page is filled with bright illustrations and fantastical suggestions as to what can happen when we imagine. Find your favourite picture on each page and encourage your child to do the same. Notice whether you like the same things or different things and talk about the reasons why you like or dislike things. Use ‘Why…?’ questions and ‘Because…’ answers. Younger children will benefit from hearing you model these question and answers, while older children will benefit from practicing how to use them. Extend this activity if your child already know how to ask and answer ‘Why…?’ questions by encouraging your child to respond in full sentences (e.g. ‘I would like to be small like a mouse because…’). Play a game of ‘Just Imagine’ where you suggest things to pretend together then act out the scenario… my favourite is pretending the room is full of custard moving around as if you’re getting stuck! Model language about ‘thinking’ as you do these activities, for example you might ‘think’ you’d like to live underground before you ‘realise’ how dirty if would be, or you could ‘decide’ you’d like to be able to fly then ‘change your mind’ and ‘prefer’ to be able to become invisible instead. You can search for this book at your local library, or ask your therapist to check the book collection at your branch of The Shepherd Centre. Until next month – happy imagining!